Cadillac is serious about playing in the international luxury car league, and none of its products demonstrate this more than the 2005 STS. The new STS shares about three letters with the previous Seville STS, otherwise it is a very different machine, and a uniquely American interpretation of the contemporary premium luxury-performance sedan. Note that the Seville nameplate is gone. With it went the front-wheel drive ``G'' large-car platform. Cadillac's premium offering is now called just ``STS,'' and is available with a 3.6-liter, 255-horsepower V6 or the 4.6-liter Northstar V8, now with 320 horses. Both engines feature aluminum alloy construction and dual overhead cams with variable valve timing, and are matched to a five-speed automatic transmission with manual-shift mode. V6 models are all rear-wheel drive, while V8s may be had with rear- or all-wheel drive. The platform is the same ``Sigma'' architecture found under Cadillac's smaller CTS sedan and SRX crossover, but stretched out a few inches. Although new STS's wheelbase is nearly four inches longer than that of the most recent Seville, overall length is down nearly four inches. On sale in North America now, the STS will soon be available in Europe - including Russia - as well as Japan, Israel, the Middle East, South Korea, and Taiwan. Cadillac is serious about competing with the best luxury cars from Europe and Japan - everywhere. To that end, panel gaps, inside and out, have been made significantly smaller, and fit and finish has improved. The new STS's size, performance, appointments, and vehicle dynamics were designed with far more than the demands of the American market in mind. I've just spent a week with a new V8, rear-wheel drive STS, and have spent plenty of time in both previous front-drive generations. And, yes, Cadillac's newest is its closest approach yet to the foreign competition, although it retains its American character just fine, thank you. But, despite driving the rear, instead of front wheels, it's really not all that different from the previous STS Sevilles in most ways, merely further-refined and developed. Its looks are distinctive, and, to my eyes, handsome, and its Northstar powertrain is first-class. So, now, are its road manners. Cadillac claims it wants to truly be ``The Standard of the World'' (an old Cadillac ad slogan) once more, and the new STS is a serious step in that direction. APPEARANCE: Cadillac is to be commended for creating its own distinctive design language. There is plenty of continuity with the look of the last two generations of Seville STS in the 2005 model's styling, and, like its immediate predecessor, it looks smaller than it actually is. Styling cues that first appeared on the Seville in the early 90s have been developing over the past decade, aided and abetted by the angular ``Art and Science'' theme of Cadillac concept cars of the past few years. The results first seen on the XLR luxury-sports roadster and the mid-sized CTS sports sedan are further-developed on the STS. But, on the STS, the angles and planes of the bodywork are ever so slightly rounded. The body proportions are classic long-hood, short-deck. The latest iteration of the classic Cadillac egg-crate grille graces the front, between the distinctive vertically-stacked headlights. A character line on the sides that rises toward the rear emphasizes its sporty wedge-shaped profile, and noticeable but not overdone rocker panels also give a performance message. At the rear, tall, thin LED taillights make the STS as distinctive at night as it is during the day. COMFORT: There is some evolution and some revolution inside of the new STS. The basic interior design is still tasteful and contemporary, with the two-tone motif of today's luxury cars. But the Zebrano wood that was almost a Cadillac trademark for over a decade has been replaced by European-style aluminum trim, and eucalyptus wood is available. The front seats offer very good support and comfort. Included in the all-encompassing 1SF option pack is heating of both front and the outboard rear seats, and ventilation of the front seats, among many other amenities and gadgets. The rear contoured bench has good room for two adults in the outboard positions, but, as is the norm in cars these days, the center rear position is best for smaller people and shorter distances. Because of the shorter overall length, the new STS's trunk is slightly smaller than that of last year's car, but it's still large enough for plenty of luggage or several sets of gold clubs. Extensive soundproofing by both design and materials makes the STS relaxingly quiet on the road. It's a great car for touring, on any kind of road. SAFETY: The new STS's structure has been enhanced for greater strength and occupant protection. Dual-stage front, front side, and side-curtain airbags are standard, as are 4-wheel ventilated antilock disc brakes, all-speed traction control, and the Stabilitrak stability enhancement system. RIDE AND HANDLING: Why the switch from front- to rear-wheel drive? Front-wheel drive gives good steady-speed traction in moderate driving, but running large amounts of power through the wheels that steer adds complexity and can result in annoying torque reactions - torque steer - through the steering wheel. Also, as weight is transferred rearwards under acceleration, a powerful front-wheel drive car will lose traction. For the best performance in a high-powered car, rear- or all-wheel drive is better than front-wheel drive. Any slight advantage of front-wheel drive in low-speed, steady-state conditions can be made up for with modern stability and traction control systems, and Cadillac's Stabilitrak is one of the best of those. The Sigma platform has been enhanced for the STS, with even greater rigidity than the CTS or SRX. The fully-independent suspension uses a short-and-long arm setup in the front, with a multi-link rear, with moderately-sized stabilizer bars at both ends. Sachs (yes, German) hydraulic shocks are standard, but my test car was equipped with the ``Magnetic Ride'' (MR) suspension as part of the extensive 1SF option package. 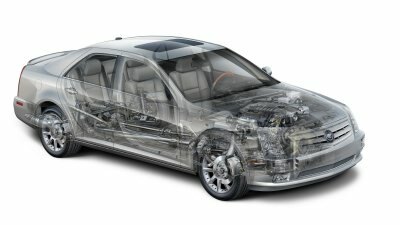 This has been a high-tech Cadillac feature for several years, and allows real-time adjustment of shock damping by electronic sensors and actuators interacting with magnetic fluid in the shocks. It keeps the tires in solid contact with the pavement, provides a firm-but-comfortable ride, and enhances the STS's cornering abilities. 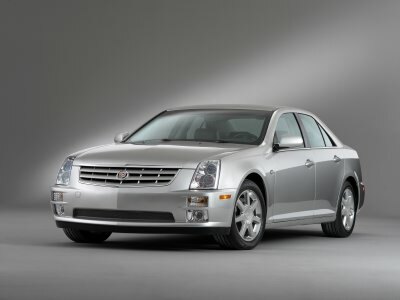 The 2005 STS is a Cadillac that is as happy being pushed on a challenging road as it is to be cruising down the Interstate. PERFORMANCE: Cadillac's Northstar engine was a gem when it was introduced in 1993, and has only improved with age. The aluminum alloy 4.6-liter dual overhead cam V8, with 320 horsepower at 6,400 rpm and 325 lb-ft of torque at 4,400 rpm, now has variable valve timing on all four camshafts and new intake and exhaust manifolds, among other high-tech features, and is coupled to a new five-speed automatic transmission with manual-shift mode. The five-speed is just what the STS has needed for years - the more closely-spaced ratios give a smoother, more-refined driving experience in automatic mode, and the ability to easily shift manually improves the sport driving experience. And make no mistake, this is a Cadillac that likes to play in the twisties. In everyday driving, put it in ``D'' and the electronic and hydraulic circuitry in the transmission and the engine's fine low-speed and midrange torque takes care of the rest. For added enjoyment, move the shift lever over to ``Driver Shift Control'' mode and let the Northstar rev. There is a healthy dose of acceleration, accompanied by a fine V8 growl. CONCLUSIONS: The 2005 Cadillac STS makes a run on the world's best luxury cars with distinctive style and rear-wheel drive performance. Engine Size			4.6 liters / x cu. in. Wheelbase / Length		116.4 in. / 196.3 in. 0 to 60 mph			6.0 sec.